TVS has launched the Grande edition of the Jupiter at a price of Rs 55,936 for the base drum variant. The disc version costs Rs 59,648, ex-showroom, Delhi. The Grande edition comes with an all-LED headlight, a new colour called ‘Starlight Blue’, premium beige interior panels with cross-stitched maroon seat, and an analogue-digital combo cluster with econometer. You also get chrome accents on the side body panels and on the front fender, apart from the body-coloured grab rails. The higher variant comes with diamond-cut alloy wheels, which TVS claims to be the category-first. However, the drum version comes with black alloy wheels. Suspension bits include telescopic front forks and a preload-adjustable (this is specific to the Grande) rear monoshock. TVS Jupiter prices start at Rs. 52,123 (Ex-Showroom) and the top end variant TVS Jupiter ZX Disc is priced at Rs. 57,623 (Ex-Showroom). TVS Jupiter is available in 4 variants and 9 colours. The claimed ARAI mileage for the TVS Jupiter petrol is 62 kmpl. A great automatic scooter with telescopic forks, 12 inch wheels and a long list of features, the TVS Jupiter has good low and mid-range grunt too and makes the daily commute effortless and is offered at great value also. Jupiter is far better than fascino. Q. Could you please suggest me TVS Jupiter or Access 125 which is the better option? The Jupiter's USP is its large 12-inch wheels, telescopic front suspension and terrific ride quality, the Jupiter will appeal to those who are in the market for an easy, practical and comfortable automatic scooter. TVS Jupiter is available in 9 different colours: Autumn Brown, Sunlit Ivary, Volcano red, Titanium grey, Royal wine, Pristine white, Mid night black, Matte blue, Mystic Gold. The Jupiter’s smooth design lines and its overall large proportions will appeal to young and mature audiences alike. Notable features of the Jupiter include an external fuel filler, standard alloy wheels for all variants, pass beam switch and econometer. There is an optional underseat mobile phone charging socket on offer as well. The scooter comes in Midnight Black, Matte Silver, Pristine White, Mystic Gold, Volcano Red, Matte Blue, Titanium Grey and Walnut Brown for the basic variant. The ZX version (disc and drum) is available in Stallion Brown and Royal Wine. For the Classic Edition, two colours are available: Autumn Brown and Sunlit Ivory. The Grande edition is available only in Starlight Blue. With such variety of colours, the Jupiter is quite appealing for people with a variety of tastes. The Jupiter gets a 109.7cc air-cooled motor which makes 8PS of power and 8Nm of torque. It features a telescopic fork setup up front and gas-charged rear monoshock, riding on 12-inch alloys. The performance of the 130mm drum brake at both ends are enhanced by Sync brake system, which is essentially a combined braking system. You also get a front disc as an option in the premium variants like ZX, Grande and Classic edition. Fuel tank capacity stands at 5 litres while the scooter tips the scales at 107kg, kerb. Honda Activa 5G: The Activa remains the highest-selling scooter in the country, consistently. Buyers often perceive the Activa to be a safer bet when it comes to reliability, refinement and mileage. The latest-gen scooter features LED headlamp and analogue-digital combo cluster (only in the DLX variant). Hero Maestro Edge: The Maestro Edge is the first scooter to be indigenously designed and developed by Hero after the brand parted ways with Honda. Its sharp styling and fancy graphics make it an ideal choice to consider for young buyers. Hero’s humongous network reach helps in hassle-free maintenance of the scooter in the long run. Yamaha Alpha: The Yamaha Alpha looks relatively sober compared to the Ray range of scooters and the Fascino. Its light kerb weight of just 102kg (disc variant) makes it one of the most nimble scooters in the segment. Instrumentation is fully digital, and for added practicality, the Alpha comes with a generous 21 litres of underseat storage. 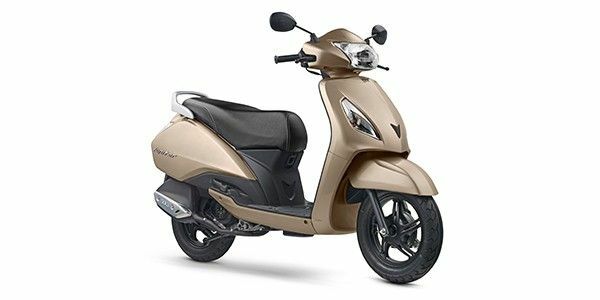 The TVS Jupiter is the Honda Activa's biggest rival. It offers a lot more features and variety (in the form of variants) than the Activa, thus making it a very sound proposition for those who want a reliable, no-nonsense scooter. The frugal engine, comfortable ride quality and the fact that it is cheaper than the Honda Activa despite offering much more make it our pick as the best 110cc scooter on sale.